Use your smartphone or iPad or Tablet computer to access additional information by scanning the QR codes on each interpretive sign. 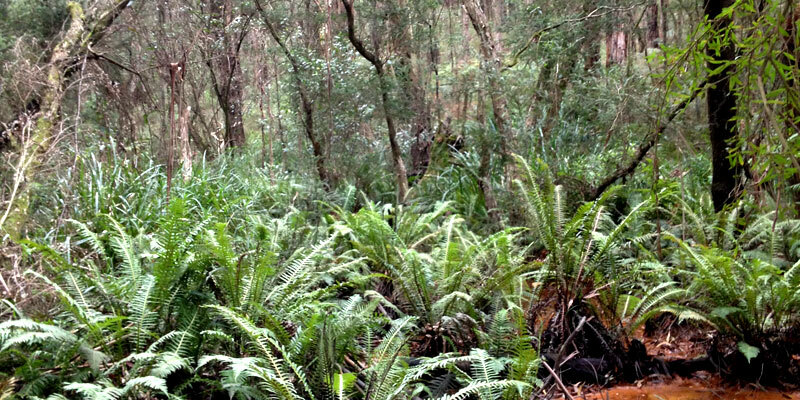 The Endeavour Fern Gully provides insight into the dynamics of a fern gully habitat as well as the changes that will occur with the re-vegetation of the land to the north and east of the bushland. Look for succession of plants in the re-vegetated area. As the new plants change the physical factors of the habitat such as humidity, temperature, exposure to wind and organic matter in the soil it will make the environment more suitable for different plants. Initial re-vegetation focused on the establishment of the main canopy trees which included manna gums, mess mates, blackwoods and peppermint. Drought over the last few years has thinned the canopy causing changes in light intensity and humidity for the mid storey and ground cover plants. Changes in the habitat can often be recognised by changing vegetation patterns in the ground cover.